Union Square is a skyscraper complex at Sixth Avenue between Union and University Streets in Downtown Seattle, Washington, adjacent to Freeway Park. It consists of two skyscrapers built in the 1980s and primarily used for office space. The entire complex features a 1,100-stall parking garage, a courtyard, a retail plaza spanning three stories and an underground pedestrian concourse that connects with the Fifth Avenue Theater and Rainier Square. Both structures were awarded LEED certification in 2009 and eventually received LEED Platinum certification 6 years later as a result of reduced annual energy consumption by 40 percent through recent renovations. 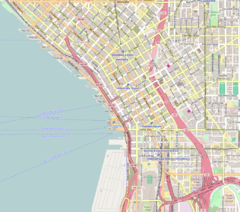 The entire complex is currently managed by Washington Holdings, a real estate firm also known as Union Square LLC which is based in Seattle. One Union Square is an aluminum clad 456-foot (139 m) skyscraper consisting of 36 floors with 2 floors below ground. Construction of this class A office building was completed 38 years ago in 1981. It is the first office building in Seattle to house all life-support systems in one location. The architect of One Union Square was TRA. Construction on Two Union Square began in 1987 and was complete by 1989. When accounting for the tip of the flag pole, the 797-foot (243 m) building is the third-tallest building in the Seattle skyline. The Seattle-based architectural firm NBBJ designed the tower, which was dedicated on July 29, 1989. Two Union Square has 56 floors with 1,126,428 square feet (104,649 m2) of rentable space, and an underground concourse connecting to the Seattle Hilton Hotel  and shopping at Rainier Square. It is the first skyscraper to use 19,000 lbs/in.2 high-strength concrete. EHI Real Estate Advisors, Inc.
^ "One Union Square". CTBUH Skyscraper Center. ^ "Two Union Square". CTBUH Skyscraper Center. ^ "One Union Square". SkyscraperPage. ^ a b "Two Union Square". SkyscraperPage. ^ "One Union Square". Washington Holdings. Retrieved March 6, 2017. ^ a b "Union Square". Union Square Seattle. Retrieved March 6, 2017. ^ "Seattle firm pays $85M for Marriott hotel in SLU". Seattle Daily Journal of Commerce. July 11, 2016. Retrieved March 6, 2017. ^ a b GmbH, Emporis. "One Union Square, Seattle - 119484 - EMPORIS". ^ Yu, Hui-yong (July 20, 2015). "Apple Said to Lease Office Space in Seattle Tower". Bloomberg News. Retrieved August 21, 2016. Aïtcin, Pierre-Claude (1998). High-performance Concrete (1st ed.). London: E & FN SPON. ISBN 0-419-19270-0. Wikimedia Commons has media related to Two Union Square.